This is one of my family’s favorite weeknight meals. It’s quick, easy, pretty healthy, and best of all it tastes fantastic. The pea and mint combination is so refreshing– it’s perfect for this time of the year and will remind you of Spring. Ideally, I like to use fresh peas in this dish, but frozen ones make an exceptional alternative. And the little salty bites of crisp, smoky bacon are a nice contrast to the fresh flavors. 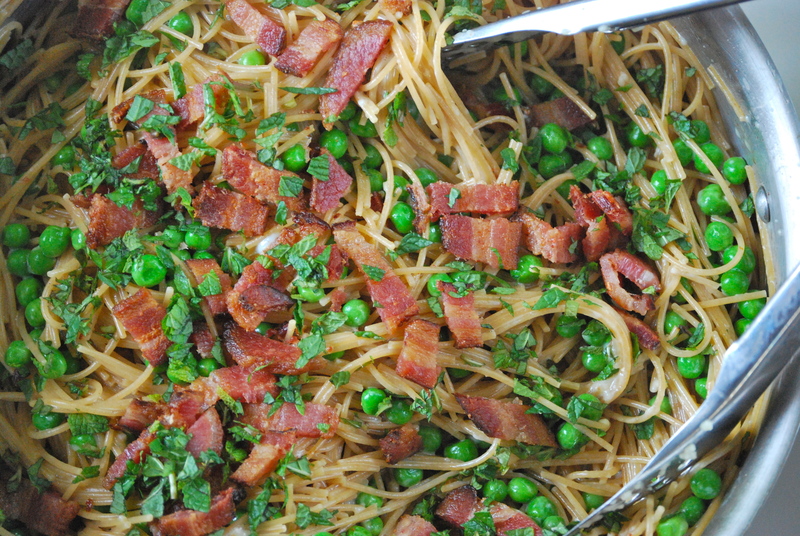 Now I love a good, rich carbonara– really, I do. But this dish is not thick and creamy. This is a much lighter version that contains very little cream and only one egg. Despite this, it works remarkably well. I reserve the heavy version for an evening when I feel like being a bit more indulgent, but for our everyday meals, I cut back significantly. The key to this recipe is to remember that it’s really just an outline. 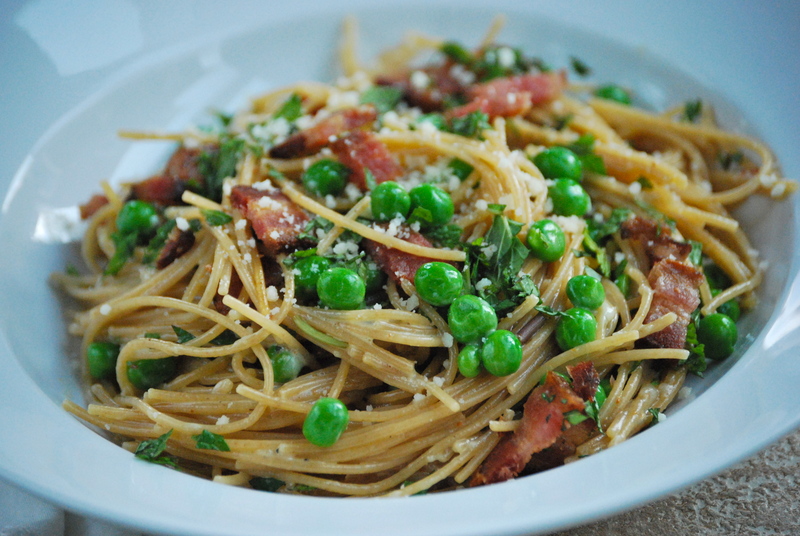 Use as much bacon, mint, peas, and parmesan cheese as you like- it’s a matter of personal taste. My family loves peas, so we use an entire package. You can certainly add more parmesan, as well. Just remember to loosen the pasta with reserved pasta water to get the level of creaminess that you want. And most importantly, be ready to eat this dish immediately. The creaminess will not last long, so it’s best served right away. One last thing: be sure to enter my cookbook giveaway I’m having to celebrate Relishing It’s First Anniversary– enter here! Cook the bacon in a large skillet until crisp. Remove from pan and wipe pan clean with a paper towel. Chop the bacon and set aside. In a small bowl lightly beat the egg, cream, and nutmeg together. Set aside. Meanwhile, cook the pasta according to directions on package. Add the peas into the hot water when the pasta is one minute from being “al dente”. Reserve one cup of the pasta water. 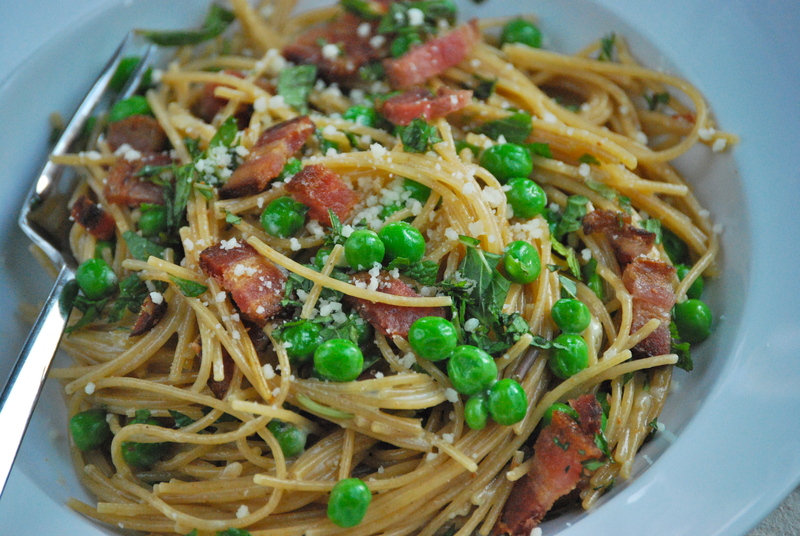 Drain pasta and peas and pour into the skillet the bacon was cooked into. Pour the egg/cream/nutmeg mixture over the hot pasta and toss with thongs. The hot pasta will cook the egg. Add a bit of the reserved pasta water to loosen the pasta more, if you desire. Sprinkle the parmesan over the pasta. Top with the chopped bacon and chopped mint. Eat immediately! Enjoy.